This trip is seasonal May thru October. We will be fishing around Orange Beach, Perdido Key FL and the Gulf Shores Area in search of the sharks! 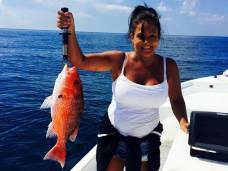 We will be targeting Red Snapper, Grouper, Triggerfish, King Mackerel, Cobia, Sharks, Bonita, and several others depending on th time of year. A dolphin cruise is a great way to see and experience dolphins in their natural habitat in and around the Gulf Shores area. 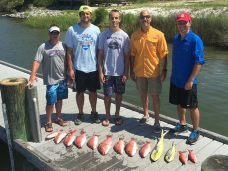 If you are looking for Fishing Gulf Shores AL and an unforgettable day on the water, you have come to the right place. 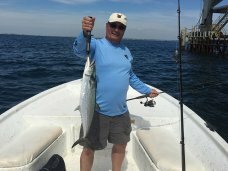 Captain Scott Roberson owner of Little Lagoon Guide Service offers a wide variety of trips that are sure to create memories that cannot be forgotten. There is no better feeling for me than helping a child land their first big catch, or seeing an avid angler achieve a new personal best catch. We specializes in light tackle Inshore, Near shore, and back bay fishing the waters of Gulf Shores Alabama, Orange Beach Alabama, Perdido Key Florida, Pensacola Florida, Fort Morgan AL, Mobile Bay, Fish River, Magnolia River, Weeks Bay and all waters in between. Whether you are an advanced angler, novice angler, or a parent looking to introduce a new and exciting experience to a youngster, Little Lagoon Guide Service is going to make sure you have the best saltwater fishing experience possible.